Update from Sarah Jane, September 5, 2018: So the first day of the hearings happened. Not going to bother recapping it. I am going to bother with bothering, even though my plate is overloaded and I already said I needed to step away from OTYCD to tend to real-world activism. I am going to keep beating the #StopKavanaugh drum on weekdays and repost the voting registration deadlines on weekends until the midterms. That means a daily post reminding you to call your Senators to oppose Kavanaugh–call your Democrats to encourage them to fight, call your Republicans to make it clear this is a goddamn farce and You Do Not Want This. After you call your senators to oppose Kavanaugh, call, text, or email your friends and family and urge them to call their Senators to say they don’t want him as the next SCOTUS justice, either. Recruiting others to the cause is key. We need a ton of people calling their Senators 24/7, making it damn clear that Kavanaugh is a NO. Refer to @Celeste_Pewter’s calling script below and forward it with abandon. Update from Sarah Jane, September 4, 2018: This post originally appeared on July 16, 2018. With the Kavanaugh hearings starting today I am making an exception to my hiatus to offer updated info on how you can #StopKavanaugh. This is another situation we have to treat like the fight to save Obamacare. We need to mobilize massive, massive, MASSIVE pressure. You need to call your Senators every day on this, and you need to recruit friends and family to call their Senators every day. For serious. Our friend @Celeste_Pewter has been diligently beating the drum on the Kavanaugh issue, stressing the importance of fighting back and giving options for how to do it. We at OTYCD are reproducing her September 3, 2018 string of tweets on the topic. Scroll down to learn how to support her and her work. All: Tomorrow [September 4] is going to be tense day for all of us. Remember: NONE of you are alone. If you need a pep talk or cat pictures, ping me. Also remember: we’re all frustrated and angry with how the hearings are proceeding, but let’s focus on what we CAN do at the moment. Our part in this can be broken down into a few steps: 1. Calling any senators we have on judiciary, and demand they question vigorously. 2. Telling our Senators to vote no. 3. Pushing for state-level protections, a la MA’s Nasty Women Act. 4. Getting 5 others to do 1-3. Tomorrow’s going to be tough. Everything you might feel tomorrow. = 100% valid. Just remember: keep focusing on what you CAN control. And if we each do those four simple steps? Imagine 4 x 1000 or 2000. That’s a lot of collective power. Let’s get to work. Ask w/ questions. P.S. 1. For those of you who are looking for this thread in text form, I’m formatting the TinyLetter now. 2. Don’t forget to hashtag any tweets about SCOTUS-related calls with #ICalledMyReps – @icalledmyreps will boost. Let’s share who’s picking up, staffers to ask for, etc. 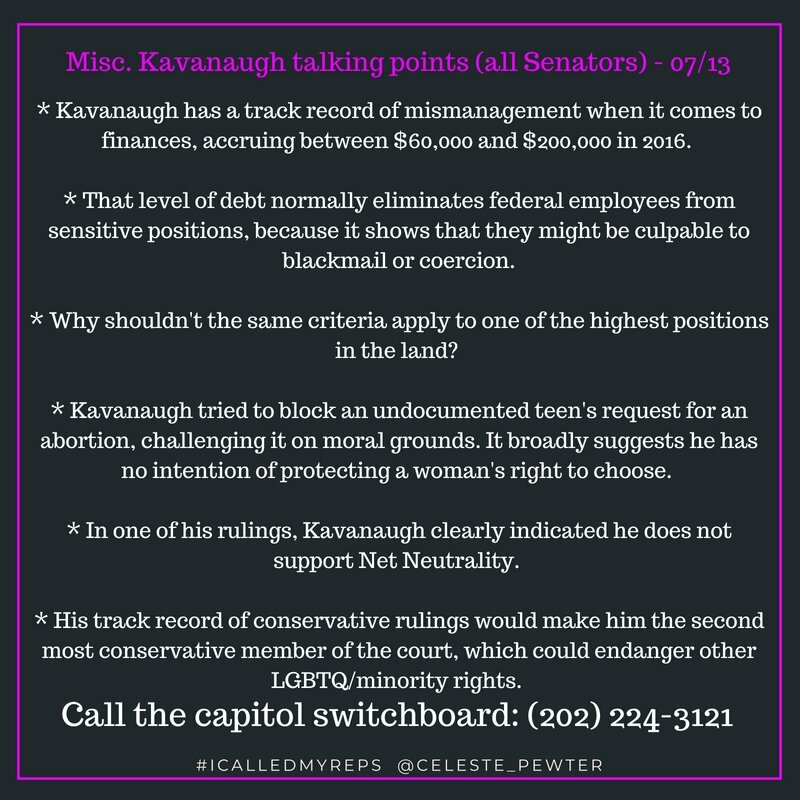 Call your senators and demand that they vote NO on Brett Kavanaugh, Team Trump’s nominee for the Supreme Court of the United States. First, an apology from Sarah Jane: I meant to write and queue this earlier, closer to when the nominee was named. Life and work deadlines got in the way. I can only apologize and repeat the fact that OTYCD is a part-time endeavor. Thanks for your patience. Anyway. We know who the nominee is now, and his judicial record is as noxious as you’d expect, given that he passed muster with The Federalist Society. We need to push back. The fight will be hard, but not impossible. And the fight will definitely be impossible if we don’t bother to fight at all. Remember: Loud, fierce, sustained protests against Trumpcare and Trumpcare 2.0 made them fail. It was the folks who called, texted, left voicemails, and showed up to protest who made the difference. If we can make loud, fierce, sustained protests against Kavanaugh, we could sink his nomination. Check the link below to see if either of your Senators are on the chamber’s Judiciary Committee. If they are, it is extra-important that you call. Bonus points if you do this on behalf of friends and family and update them on their own Senators. Before you call, you should check the social media feeds of your Senators and see if they’ve issued a statement on Kavanaugh. If they’ve already agreed to vote no, thank them for that. If they’ve already agreed to vote yes, urge them to change their vote. Celeste Pewter (@Celeste_pewter) got there first with great scripts on this topic. The trio you see below are a) a script supporting the McConnell rule, updated to reflect the name of the SCOTUS nominee; b) a simple ‘No on Kavanaugh’ script; and c) talking points you can use to expand on the main scripts. Please scroll down to learn how you can support Celeste Pewter’s work. Here are additional ways to support Celeste Pewter, author of the black-backgroundedscript above. page or checking the About & Subscribe page. And tell your friends about the blog!